Arthur Antunes Coimbra, famously known as Zico is one of the greatest footballer in Brazilian football history. He was even remarked as “white people” for his brilliant attacking moves and specialization in free kicks. 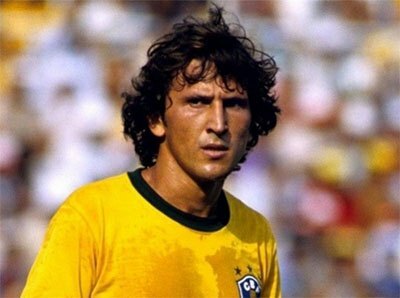 Zico played three World Cups from 78 to 86 under the Brazilian soccer team and won the hearts of millions of people. Pelé, the god of football once said, “Zico is the only one who resembles my playing method”. Here we present a short biography on this cocker sensation named Zico and summarize his professional career. 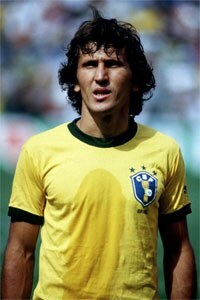 Zico in the Brazil shirt. Zico was born on 3rd March in the year 1953 in a lower middle class family of Rio de Janeiro in Brazil. He was Portuguese by birth and it is believed that football is in the blood of all Portuguese and Zico was no different. He has excellent skills and often bunk classes to attend Juventude club. It was a non famous street team of Brazil, but after getting Zico in the team, they became quite popular in the area. He started his soccer journey from there and now he is in professional coaching phase by managing top clubs worldwide. In the year 1968, when Zico is playing under Juventude, he gave a trial at America Soccer club and got the chance to play one game for them. During the game he showed some marvelous goal skills and was caught under the attention of a reporter. The reporter suggested Zico’s father to take him to then famous club Flamingo where history was created. He was a very feeble player in his early childhood, but played all matches with sheer dedication. After playing 116 matches under Flamengo, he was promoted to its senior team. He played at Flamengo for 12 long years, but he used to get lucrative offers from bigger clubs like AS Roma, Real Madrid, AC Milan and lots more. But he selected Udinese Calcio above all the other great clubs as he was promised to be paid more than 10 million dollars at Udinese. His performance at that club was beyond amazing as he scored more than 400 goals in mere 697 matches. He was an attacking midfielder for all his life, but his goal scoring statistics are out of this world. Regardless of his brilliant performance at Udinese, he was not capable of assisting the squad triumph one title in his 2 year span. He was voted the best player for 78 and ’82 World Cups after showing his explosive power. After the 1982 World Cup he got affected by injuries and had to leave Udinese. He again came back to Flamengo and played there for 4 years. His last club as a footballer was Kashima Athens Soccer club after which he announced his retirement from professional football in 1994. A few years after his final game for Kashima Antlers Zico would become manager for the same team. It would be the start of a new phase of life in the ring of coaching. 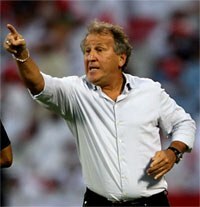 Zico has been the manager for both clubs (Kashima Antlers, CFZ, Fenerbahçe SK, Bunyodkor, CSKA Moscow, Olympiacos, Al-Gharafa and FC Goa) and national teams (Japan and Iraq). At this moment he is coaching FC Goa, an Indian Super League team. He was married to Sandra Carvalho and they have three children together. See the compilation with some of Zico's greatest goals.